Warm weather residents of the area around the Inn on Mill Creek Bed & Breakfast in the western North Carolina mountains, the Indigo Buntings typically arrive in mid-Spring from their winter homes in south Florida and South America. So if you’re in our neck of the woods in from May through August, you have the opportunity to see one or more of these blue beauties. 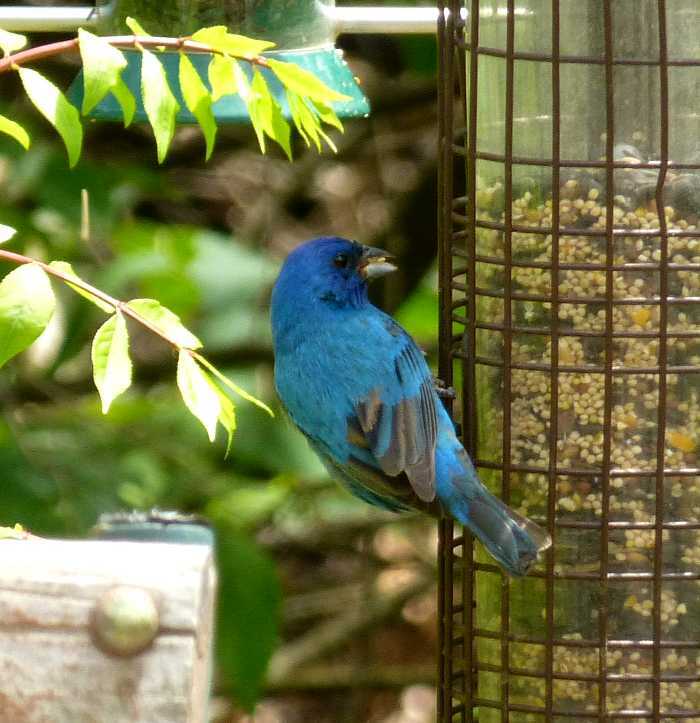 Indigo Buntings eat berries, tree leaf buds, insects and small seeds. And the fact that they like to snack on small seeds makes them a regular visitor to the birdfeeders at the Inn. 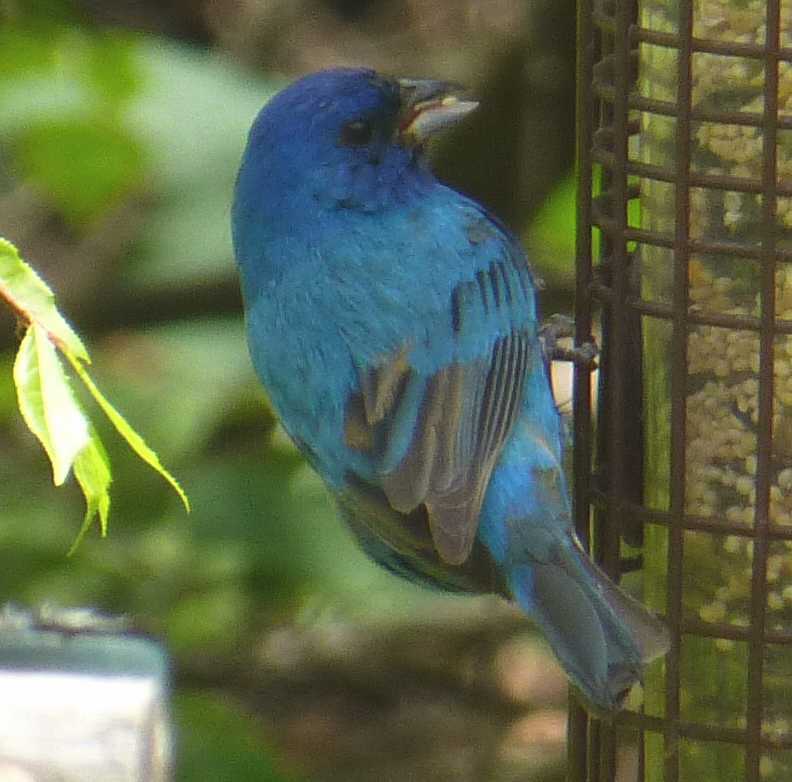 This May in particular, we’ve seen a number of Indigo Buntings at our feeders, as evidenced by all the photos on this blog post! 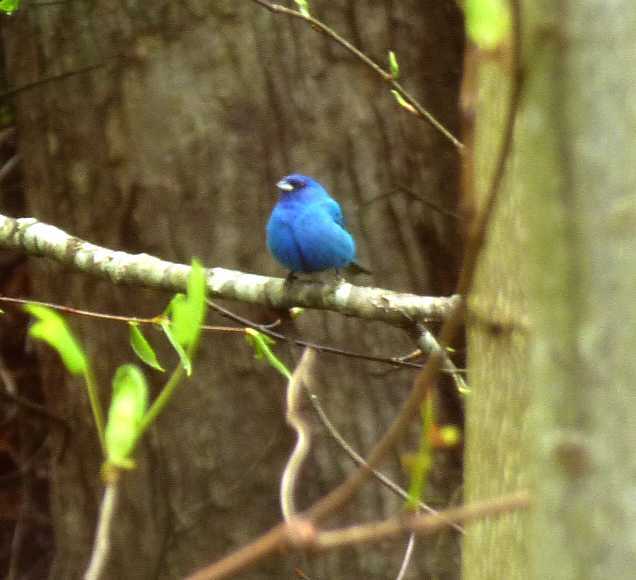 So we’re giving this bright blue bird the May spot in our 12 Months of Birding at the Inn series. They’re night migration birds, using their internal clocks to adjust their angle of orientation to the stars. They aren’t really blue…meaning, rather than having blue pigment, Indigo Buntings have “microscopic structures in the feathers that refract and reflect blue light”, which is the case with all blue-colored birds. Their songs can vary if Indigo Buntings live a few hundred yards from each other, but if they are close enough to each other, they’ll share nearly identical songs and pass those songs on to young Indigo Buntings living in the same “song neighborhood”. For upwards of 20 years, the song in an area can remain the same, gradually changing as new singers add variations. 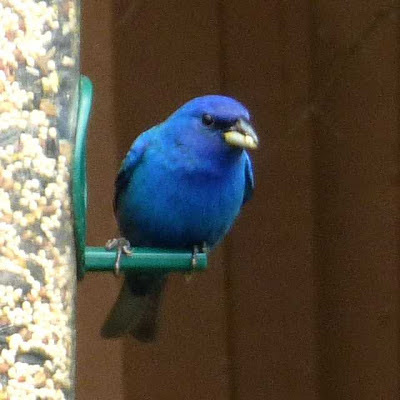 I just saw my first indigo bunting at my home in Creston this morning! So excited!!! That is awesome! 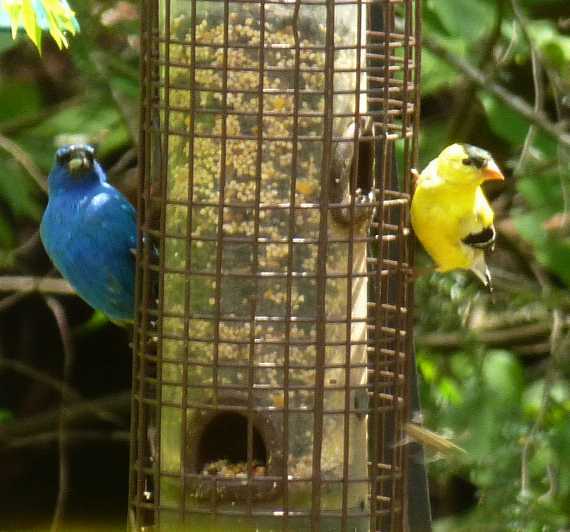 They love sunflower seeds, so if you have feeders, they may stick around for the summer season. 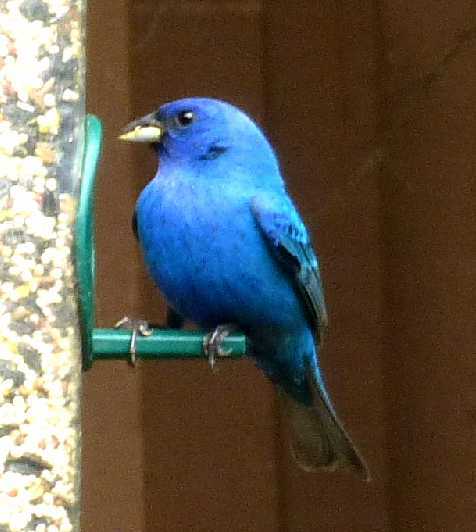 I have one in my yard..I live Va..he is so beautiful..i have lived here for ten years and I have never seen one.. Very exciting!! They’re usually in our neck of the woods between late April and August, and tend to come and go over the years. Last year, we did not see any, but this year we have had sightings. Hopefully, yours will bring lots of enjoyment this year and come back next year. They are so beautiful. 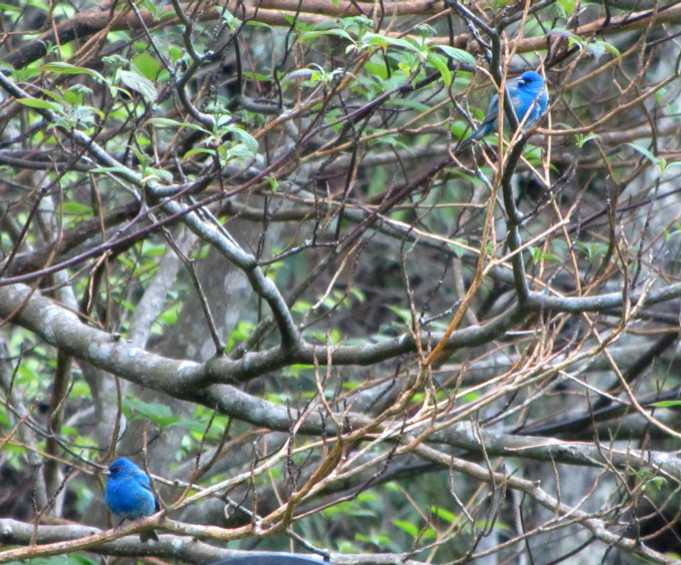 Just saw a pair. First time. Beautiful! Loved in N.C. less than a year and getting to know my birds. Awesome! They are one of our favorite birds for sure.